TPThursday just sort of snuck up on me this week, again and I didn't feel like digging through my files. So, I hopped over the bar and snapped this shot with a camera I was working on. I thought it'd be nice to show everyone our island's #1 beer. I rarely touch the stuff these days. BURP. 'scuse me. I just chug it real fast ! At last count, which has been pretty much put on hold for 18 years now, I had tried over 60 different brands of beer. 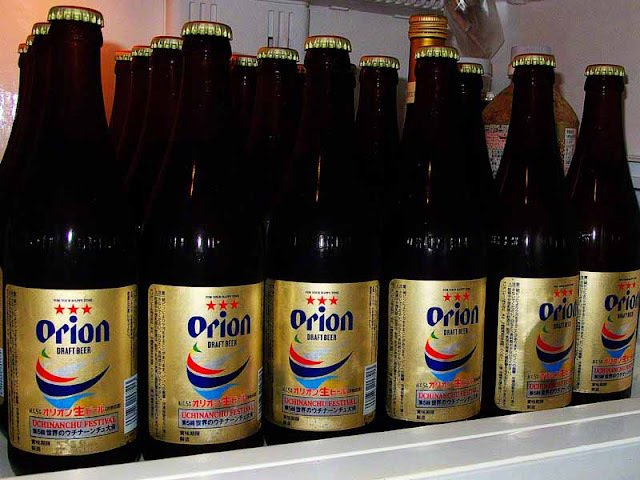 I never got around to Orion, but I have drank a Kirin or two. I found it to be drinkable, but when given a choice of others, I probably wouldn't pick it again. By the way, I love orange juice, but it doesn't always love me. Yup, I used to like orange juice but it started getting more expensive that a gallon of gas. So, I switched to Tang. That's one less thing I'll have to adjust to if I ever decide to become an astronaut. I saw a blog the other day of people in hot tubs full of beer - so it must be good for your skin too. And you really drink Tang - I save that for camping. I think beer is yucky. But maybe I just haven't found one that I and my taste buds like? I thought everyone knew beer was better for you Mike? I'll help spread the word over here just as soon as I finish this crate of Tennants. I'm emailing this to my wife...she's going to be laughing over her wee laptop soon! HaHa Mike...that's a big fridge! I'm not much of a beer drinker, but when I was in Japan last summer I had a big can everyday. I was so hot and tired at the end of the day. That was the best beer I have ever had!! HikeBikeTravel, A beer bath sounds good. Alison, Beer, I guess you have to acquire a taste for it, just like Tang. Ryan, We should write a book together. A crate of tennants? Huh? American homeless live in cardboard boxes or under bridges. You guys stuff em in crates? Dang ! Jim, Sonovagun why didn't I think of that? Get the l'il lady a laptop and send her emails insteada talkin' to her! LadyE, The fridge does look big in the photo but, it's really a squeeze getting just one case of beer in there. Lucky for me, the liquor store is just across the street. When you're right, you're right. And you're right.